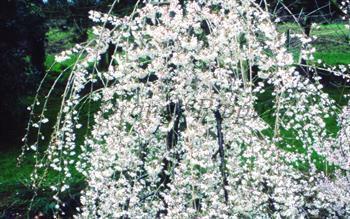 Snow Showers is a popular flowering cherry noted for its numerous long weeping branches, which hang in profusion from the main stem. In spring the dense display of white blossom covers the branches, creating an effect which is indeed reminscent of a shower of snow flakes. Snow Showers is a relatively small tree, and slow-growing, making it the ideal choice as a feature for the smaller garden. Please fill in the details below and we will let you know when Snow Showers flowering cherry trees are back in stock.